Spending an afternoon drinking in the alley with your favorite neighbors is all well and good, but around the 8th bottle of Alamo things might get hazy. The Intoxicase for iPhone not only tracks how many man sodas you've consumed, it will even crack you open a freshie as well. 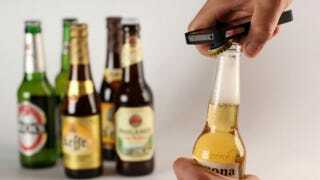 The Intoxicase is a two part system composed of a bottle-opening iPhone 4/4S protector and drink-tracking free app. The case includes a sturdy bottle opener mounted on the phone's back, rather than weaker bottom edge like other opener-cases. The case actually comes in two varieties: the Intoxicase, which features a fixed Pub-style opener, and the Intoxicase Plus, which features a slimmer, folding-style opener. The standard versions costs $35 at the Intoxicase site, the Plus retails for $45 and is still on pre-order.